Sev Tomato recipe is a homemade instant preparation of tomato and bhujia (any namkeen), typical gujarati dish. Heat oil in kadai and add asafoetida and cumin seeds, when they begin to change colour or when it crackles add onion into it. Sauté till it changes the colour. Now add ginger garlic paste and sauté for half a minute. Now add tomatoes and all the other dry ingredients into it. Saute for few minutes on high flame. Now add bhujia and mix well. Add milk and mix it well till the gravy thickens. 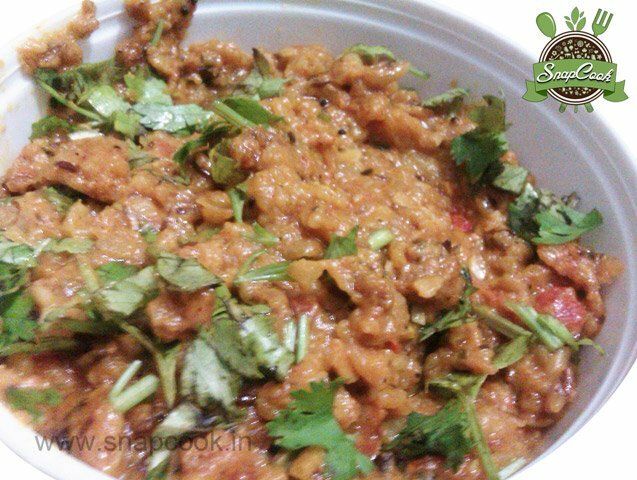 Garnish with coriander leaves and sev (bhujia). Enjoy it with hot rotis/chapatis. Make this as close to serving time as possible. You can also add pav bhaji masala and while serving you can put butter on top.